Not many pastors rise at 3 A.M. to be sure they have sufficient time for God and their people. Samuel Rutherford was one who did. Thus it came as a great blow to him when he was compelled to leave the folk he loved. Rutherford had published an Apology of Divine Grace against the heresy of righteousness based on human works. This work offended the government. On this day, February 20, 1636, Archbishop Laud, who controlled the established churches of Britain, exiled Rutherford to Aberdeen. He forbade him to preach anywhere in Britain. It might seem Rutherford could not be blamed if he slipped into depression. The years had not been kind to him. In 1630, after barely five years of marriage, his wife died following a painful illness of thirteen months. Their two children also died, and Samuel himself suffered a debilitating fever for three months. Now he was in exile, excluded from the work he cherished most. But rather than become depressed, he wrote encouraging letters to his friends and his church home. These are full of wise and pithy sayings: "Duties are ours, and events are the Lord's." Or, "It is not for us to set an hourglass to the Creator of time." The hundreds of letters he wrote in exile became a classic. Full of encouragement and loving devotion to Christ, they showed that Rutherford had an intimate communion with the Lord and was not afraid to talk about it. He always wrote about Christ and the wondrous glory of His Person. Charles Haddon Spurgeon later said, "When we are dead and gone, let the world know that Spurgeon held Rutherford's letters to be the nearest thing to inspiration which can be found in all the writings of mere man." In 1638 Rutherford was restored to his church. His many sufferings gave him even greater sympathy for the suffering in his flock. 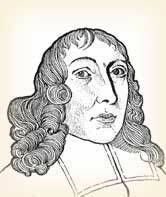 During the 1640s, Rutherford represented the church of Scotland in the Westminster Assembly in London. He helped author the Shorter Catechism, with its famous beginning, "What is the chief end of man?" Glimpses #95. Worcester, Pennsylvania: Christian History Institute. "Index to Samuel Rutherford." Fire and Ice: Puritan and Reformed Writings. (www.puritansermons.com/ruth/ruthindx.htm). Loane, Marcus L. Makers of Religious Freedom in the Seventeenth Century: Henderson, Rutherford, Bunyan, Baxter. Grand Rapids, Eerdmans, 1961. Rutherford, Samuel. A Selection from his Letters. Grand Rapids, MI: Christian Classics Ethereal Library. Rutherford, Samuel. Letters of Samuel Rutherford , with a sketch of his life and biographical notices of his correspondents, by Andrew A. Bonar. Edinburgh, Oliphant, Anderson & Ferrier, c. 1891. "Rutherford, Samuel." The Oxford Dictionary of the Christian Church. Edited by F. L. Cross and E. A. Livingstone. Oxford, 1997. Whitehead, John. The Second American Revolution. Elgin, Illinois: David C. Cook, 1982; especially pp. 28ff and 153ff. Whyte, Alexander. Samuel Rutherford and Some of His Correspondents. Edinburgh: Oliphant, Anderson and Ferrier, 1894.